Our latest area rug winner has been selected. 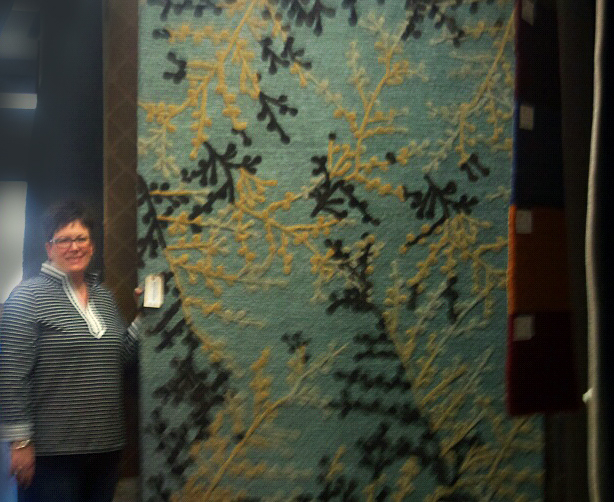 Congratulations to our January area rug winner! Melisa chose this modern patterned area rug with neutral colors for her home in Carmel, Indiana. 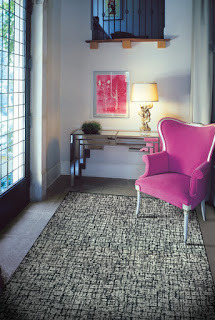 Kermans Flooring continues its Rug-A-Month Giveaway in 2013! Many Indianapolis area residents have been selected already--see winners on our Facebook page. It's easy! Sign up for our email newsletter or LIKE us on Facebook and be sure to type WIN on our wall with your email address. A winner is selected at the end of each month! Area rugs make a difference in your home and can add a completely new feel to a room whether you are looking to modernize the room, add warmth, or show personality. The small corner room on the left is an example of how a small area rug can add personality, and the furniture choice adds burst of color to compliment the rug. Everyone's styles and tastes are different, and at Kermans Flooring in Indianapolis, we have a wide collection to choose from. We invite you to visit our showroom in Castleton to see the selection. Our friendly design staff awaits your visit. We also suggest you read our "Before you buy an area rug" guide before stopping by.